Jon Jay had three hits, a walk, an RBI and two runs scored against the Brewers. 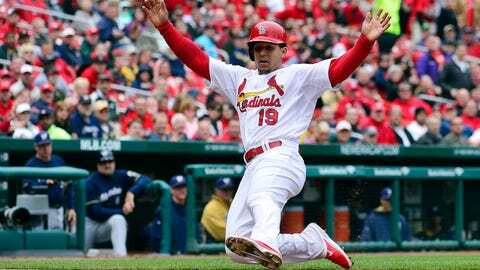 ST. LOUIS — After failing to hold three-run leads in two straight games, Allen Craig and the St. Louis Cardinals put their series final against Milwaukee out of reach. Craig homered on a four-hit day that included three RBIs, and Matt Adams hit a three-run homer as the Cardinals beat the Brewers 9-3 Wednesday. "It’s nice to see some big production that we know is going to come from certain guys" said Cardinals manager Mike Matheny, who slept on his office couch after an 11-inning loss Tuesday night. Jon Jay had three hits and a walk his first four trips to the plate. The Cardinals avoided a three-game sweep against the team with the best record in the major leagues. "I’ve been feeling pretty good at the plate for a little while now, hitting some balls hard," Craig said. "Frustration’s part of it. Things are going to turn around." Shelby Miller (3-2) worked around homers to Mark Reynolds and Carlos Gomez, allowing three runs and six hits in six-plus innings. "Kind of little rough early on," Miller said. "It’s always nice to have a lot of runs scored for you, but at the same time, you’ve got to act like it’s a close game no matter what." Milwaukee is 20-8, a franchise record for wins through the season’s first full first month. Matt Garza (1-3) joined the lengthy list of injured Brewers when he was removed in the fourth inning because of a bruised right thumb from getting jammed on an at-bat to end the third. He said there was no doubt he’d be ready for his next start. "I’m going to make sure I’m OK by then," Garza said. "I’m not here to skip a start, I’m prepared to pitch. I want to get right back out there.’"
Ryan Braun (oblique) and Jean Segura (cut on head) didn’t start during the series, and Aramis Ramirez (elbow) was out the last two games for Milwaukee, which batted light-swinging Scooter Gennett third. Segura and Ramirez are expected to return Thursday for the start of a four-game series at Cincinnati, though Braun remains day to day. Manager Ron Roenicke said Braun will not start Thursday and added, "In a couple days, he needs to be ready to go." Segura played the eighth at shortstop and doubled in the ninth. It was 50 degrees at game time. The sun popped out of the clouds a few times, each time getting a big cheer. Matt Holliday’s RBI single put the Cardinals in front in the first, Reynolds hit a two-run shot in the second and Adams answered in the third with his second of the season, estimated at 439 feet, for a 4-3 lead. Craig doubled for the second straight at-bat in the fourth, driving in two runs off Wei-Chung Wang, and RBI doubles by Miller and Jay made it 8-3 in the fifth. The four-hit game matched Craig’s career best. He had seven hits in the series, including two homers, lifting his average to .220. Miller allowed three runs and five hits the first three innings, but no runs on one hit and three walks the rest of his outing. He’s given up seven homers. Garza was charged with five runs and rookie Wei-Chung Wang gave up four runs in three innings. Backup catcher Martin Maldonado pitched the eighth for the Brewers, the 13th reliever needed to cover 16 innings in the series. Roenicke told Maldonado not to throw too hard. NOTES: The Cardinals are skipping the fifth spot in the rotation, taking advantage of a day off Thursday and planning to start Adam Wainwright against the Cubs’ Travis Wood on Friday in Chicago. Marco Estrada (2-1, 2.87) is to pitch for the Brewers on Thursday, opposing Homer Bailey (1-2, 6.15). 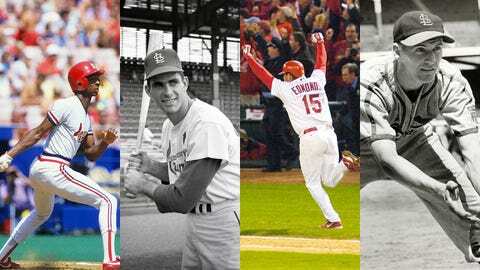 … The Cardinals said Jim Edmonds, Willie McGee, Mike Shannon and Marty Marion will be inducted into the team’s Hall of Fame in August. … Jay is 8 for 13 against Garza. … Miller has 19 career wins, including a 5-0 record against Milwaukee.